Anyone who works near or in a big city knows half the battle of working is the commute. What if your commute were as short as walking to your kitchen table or an outdoor office? Well, for several people in the modern age — it is. Home-based businesses are more prevalent these days than you might think and can exist in almost an industry. For many, the possibility of what one can do from the comfort of their own home is only limited by their own creativity. For Sandy resident Geri Bovee, a former registered nurse, that creativity led her to open an in-home tattoo parlor, Cosmetically Correct. Bovee has tattooed since the 1990s, starting out in a small shop in Welches. 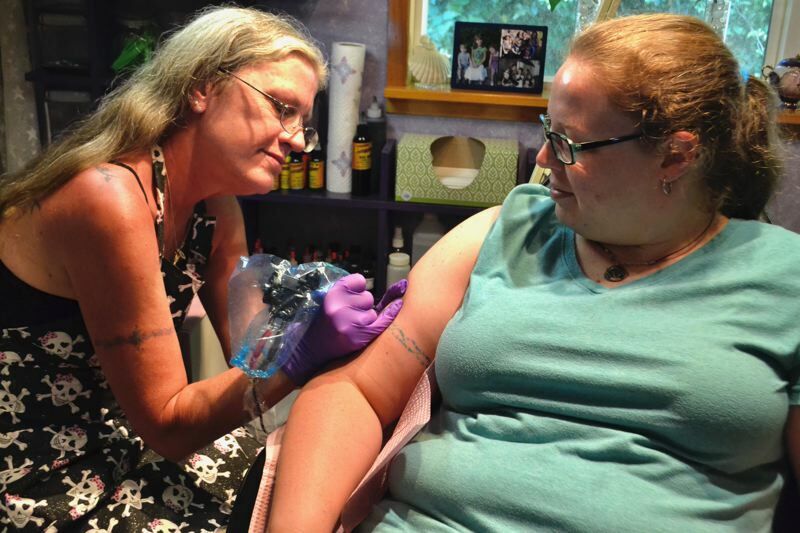 Her passion for ink started after watching her daughter get a tattoo and thinking "I could do that," and over the years that passion has gone from being part-time to full-time and operated from a shed on her Sylvan Drive property. "I love being able to do my artwork in a different way — on people's skin," she noted. "It's satisfying." Bovee turned to operating from her home greatly because of the cost to rent a retail location. "I was working as an RN during the day and just did (tattooing) in the evening," Bovee explained. "The rent just kept going up, so I decided to go home-based." Bovee worked as an RN for 30 years in Mt. Hood Medical Center's operation room, but now focuses solely on her art. Being a former RN does, however, assuage many clients fears of going in for a tattoo. It also helped her pick up knowledge of sterile tech, required knowledge for any tattoo artist. "I also get inspected just like any tattoo shop," Bovee noted. For Bovee, one of the biggest perks of operating her business from her home is "it's very convenient." For her and for her customers. Bovee's shop is separated from her home by a wall and wasn't as hard to get permitted as one might expect. Bovee simply has to renew her license every year, and initially all it took to set up shop was having a separate bathroom on the premises. And customers seem to appreciate the seclusion. "It's very private," Bovee added. "Some people that are older don't like to go into big shops, but they're comfortable when they come here." Some in-home entrepreneurs start businesses out of necessity because they need additional income, and others because they see a need in other people. Christy Veselik and Angela de Bree' of the Sandy-based Beeing Kind are of the latter persuasion. Veselik was a happy stay-at-home mom when she came up with the concoction that launched Beeing Kind. She had been experimenting with making honey, originally for the purpose of skin care, and stumbled upon a now quite popular combination of coconut and honey. "Originally the spread was supposed to be a face cream," de Bree' said. "But it was kind of an accident that it tasted so good," Veselik added. Now, less than two years after launching, the domestic duo have their product in several area stores, including Bob's Red Mill, Dave's Killer Bread, the Sandy Historical Museum and Tollgate Inn Bakery. "We did it a little backward," Veselik explained. "We started in stores before we ever went to a (farmers) market." For Veselik, one of the main attractions of running a business out of her home was that "nobody tells me what to do." "I ran my own house for 20 years," she noted. "I didn't think I could have someone run me." de Bree' was a high school friend of Veselik and more than happy and enthusiastic to be involved with the company. She was also one of the first taste testers of the product. "I think both of us are really creative when it comes to cooking," Veselik said. "I'd say Angela is a little more fancy and I'm a little more hillbilly." There are certain limitations on running a food business in your home. To produce in a domestic kitchen, you have to have the septic system and the well approved by the county. But, de Bree' explained, "we went through the right hoops." "It's about doing your research when you're dealing with the Oregon Department of Agriculture," Veselik added. For many businesses started in home kitchens, growth can also be intimidating, and with one's office ever at one's fingertips, it's tempting to work more than is needed. For now though, the women of Beeing Kind are "in a gain and gaining momentum." "We're growing the business where we can sustain it," Veselik said. "In theory we could work full-time at this, but we don't want our business to own us." "We're growing at a pace that we can handle," de Bree' noted. Separating work from home when your "office" is where you live can be a downside for home-based business owners. Pam Enos is no stranger to this. With her business, Boring Goats, Enos spends about six or seven hours a day every day making soap and/or filling orders. And, as a farmer, she understands that she isn't solely making her schedule — the goats are. Enos grew up hobby farming and as an adult decided she wanted to do something a little different. Though she hadn't worked with goats before, she learned more about them through a friend and found herself "impressed by the productivity of this tiny animal." So she began researching more and more. Enos found goat's milk had proven health benefits for people's skin. Because she suffers from eczema, she tried it out by making what would be the first of many batches of Boring Goats soap. "I was also looking for a way to make the farm sustainable," Enos explained. "It's hard work, but it's the kind of work I enjoy." Enos started making soap and giving it to friends in 2008, then founded her LLC in 2010. Enos was the creator and her husband was the businessman. 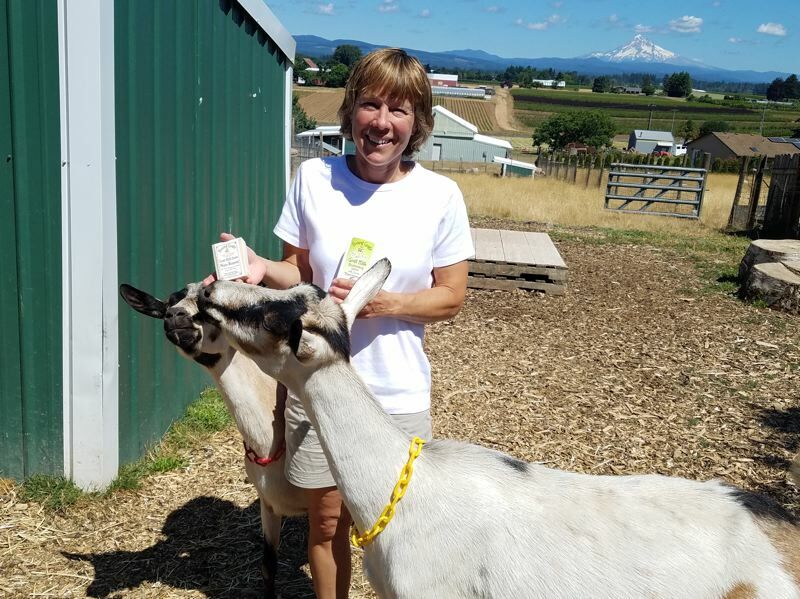 Unfortunately, Enos' husband passed away in 2014, but Boring Goats has remained a family operation through the help of Enos' daughter Laura Butterfield. "It's truly a family business," Enos said. "Whenever we need something everybody contributes something." The biggest challenge Enos has faced in business is truly the loss of her husband. "My husband was always very confident in making it work," she said. "This went from being a hobby business to my only source of income." Even so, Enos noted that she never compromises on the quality of her ingredients. "My profit is lower, but hopefully I'm making good products," she said. "I'm proud of our ingredients. I'm not required to put my ingredients on the labels, but I do." She also enjoys the flexibility working from home affords her, even with goats to tend to, and the connection to her community it creates. Enos' soaps and lotions can be found in several local stores, such as Boring Bark, Burns Feed Store, Designer Yarn, the Sandy Historical Museum and Whole Foods. "The fun part of being part of this community is we're all family-owned businesses," Enos noted. "We all enjoy supporting each other. We really appreciate the support we've had in the community and we hope people know we support them too." There are several types of home-based businesses people don't think of as being home-based. Many are in the labor industry. Mark Griffith of Platinum Landscaping Maintenance and Brian Burns of Mt. Hood Home Inspections have offices in their homes, but you'll seldom find them there. As men in the labor industry, they're really only home to do paperwork, but they "work from home" because they wanted the independence. "I wanted to be my own boss," Burns said. "I wanted to be able to set my own hours and have control over the finances, (and) when I first started I had kids. It made it nice (to schedule around my wife's work and be with them)." Griffith started out in landscape maintenance as an apprentice, working for someone else and on their schedule. As the son of a long-time grounds maintenance man, the field was a given for him. 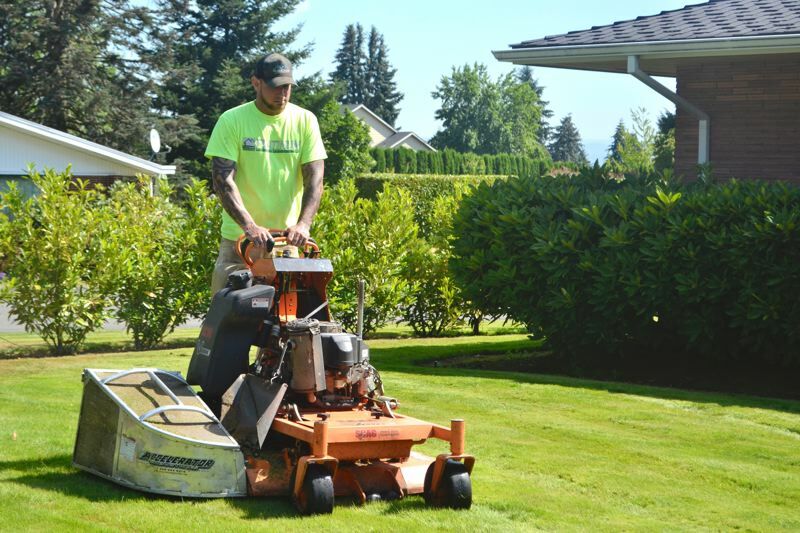 He is still a one-man crew, but manages several accounts — from the average resident's lawn to large commercial properties. "I wanted more, so I started my own business," Griffith noted. "Over the last three months it's taken off like crazy." Though Griffith didn't have to worry much about any one structure, like his "home office" being permitted, he did have to become licensed, and he plans to continuously build on his expertise, possibly working into the landscape construction side of the industry. Griffith said the biggest perk of working for himself and having his own business is "the gratification of seeing my work day in and day out and knowing I accomplished that myself." He also enjoys the connection he gets with customers. "It's kind of fun," he explained. "You build relationships with some of the residential clients. It kind of makes the business personal." Burns has a similar people-oriented philosophy when it comes to home inspection. As a former construction worker, Burns sees how his business and expertise fit in the bigger picture of purchasing or selling a home. "Home inspections are really important in home transactions to protect the buyer," he explained. "It protects your investment. I totally enjoy letting people know what they're buying."